Lamb | eat. live. paleo. 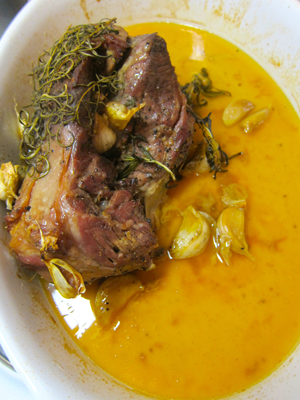 Lamb shoulder blades entered into our dinner repertoire because they are surprisingly delicious, and, compared to other cuts of lamb, less expensive, thereby making them a good “everyday” option (i.e. not “special occasion”). When we first bought shoulder blades to cook at home, we worried that the meat might be chewy (they kind of look it at the butcher’s); but after marinating overnight and cooking them simply, the meat on the blades are tender and very flavorful. 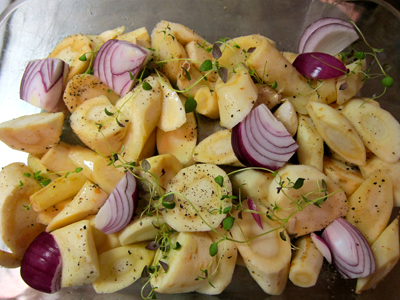 I marinate the blades in my go-to mix of lemon juice, garlic, and olive oil overnight. Although some pieces might be a little sinewy or have an intricate maze of bones — requiring patience for the eater — lamb shoulder blades are a good option if you want a good amount of lamb for less. I’m sure slow-cooking will be a good method for them. So far I have seen 2 types of grass-fed lamb shoulder blades: New Zealand and Icelandic. The Icelandic lamb is smaller than the New Zealand lamb. 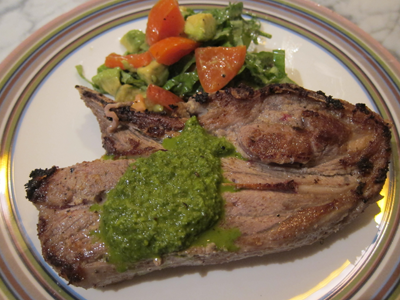 Although lamb blades may not be to everyone’s taste, if you’re interested, it’s worth trying! 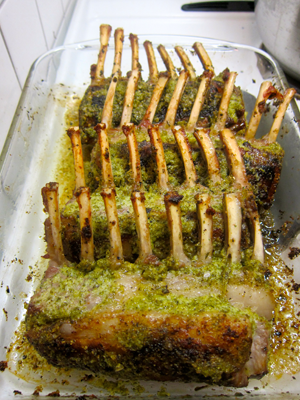 For the main course of our Christmas Eve dinner, I roasted rosemary/garlic/lemon-crusted racks of lamb. 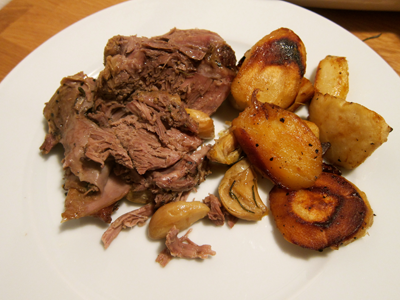 I found very nice, trimmed, Frenched racks of lamb at our local supermarket — Swedish lamb — very fresh and lovely. I bought the equivalent of 2 full racks (each rack I bought were split into two, made smaller than I’m used to in the US). 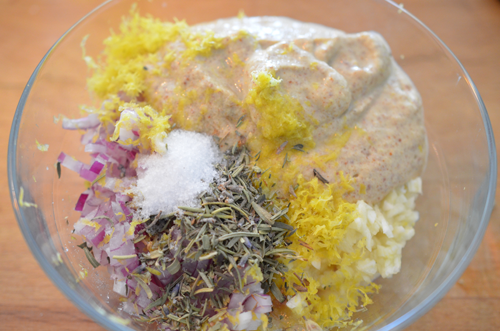 The marinade itself is very simple yet extremely flavorful. Personally, I think the most important thing when roasting a rack of lamb is using a good thermometer, so that you could cook it to your desired temperature. This dish was a smashing success, and felt very suitable for our main course for Christmas Eve (and would be great for dinner parties in general). Season the racks with salt and pepper. In a food processor, make the marinade: blend the rosemary, parsley, garlic cloves, zest and juice of lemons, as well as olive oil. I only have a small food processor in our Stockholm apartment, so I made the marinade in 2 batches. Coat the racks with 1/2 of the marinade; set aside the other 1/2 marinade to use later. Cover the racks and refrigerate for 6 hours or overnight. Preheat the oven to 400F (about 200C). 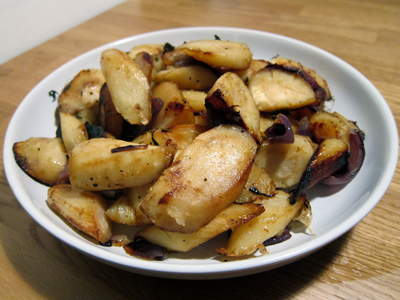 In a medium skillet/pan, heat 1 tablespoon of the oil until shimmering. Add the lamb to the skillet, fat side down, and cook over moderately high heat until lightly browned, about 3 minutes. Turn the lamb fat side up and cook for 2 minutes longer. 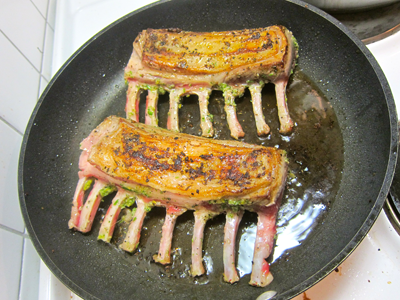 Transfer the lamb racks onto a roasting pan. 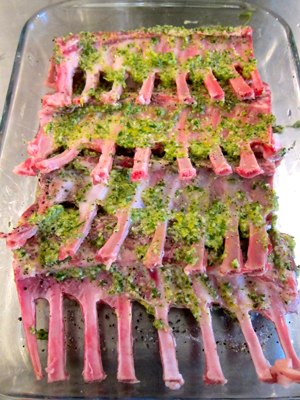 Let cool a little bit, and coat the lamb racks with the remaining 1/2 of the marinade. Place in the oven and roast the racks for about 20 minutes, until the thermometer inserted in the center of the meat registers 125° for medium-rare. Transfer the lamb to a carving board and let rest for 10 minutes, then cut into chops. 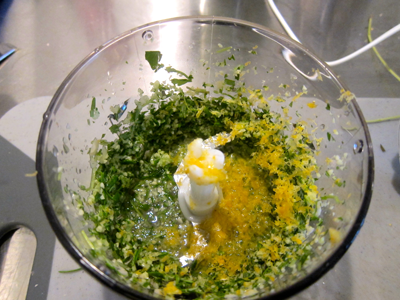 I served the lamb with a mustard/mint/lemon aioli, which I blended together in our small but very useful mini-food processor. When we first arrived in Stockholm, I came across several online discussion forums in which British, American and Canadian expats lamented about the difficulty of finding organic produce in Stockholm. Quite a few people complained about the quality of meats relative to pricing. One British person even shared that s/he brings back lamb every time s/he visits the UK, because s/he can’t stand the taste of lamb available in Stockholm! (I am not sure how this transportation of lamb meat was achieved…) Initially, these discussions scared and worried me; thankfully, however, I find our grocery-shopping experience in Stockholm to be just fine so far. 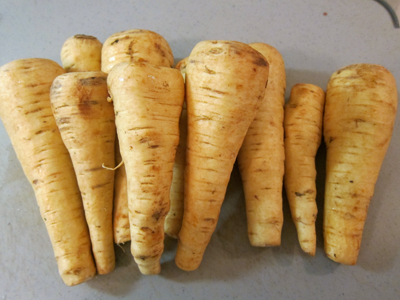 I don’t know how much the quality of produce varies from one neighborhood to another, but we quite love our local Daglivs. We can find most everything there. Although we sometimes opt to indulge in fancier meats from the butcher in the Östermalmsaluhall (we LOVE M Seger Eftr. 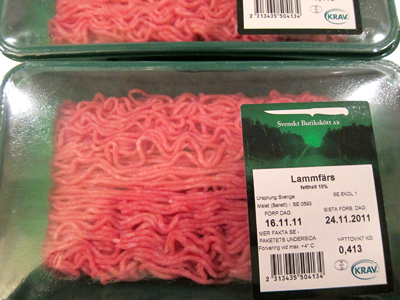 Kött & Ost) or Taylors & Jones, we are happy with our local supermarket, where we can even find Krav (organic) ground lamb. Back in New York, I never buy ground lamb — in great part because, when I do see ground lamb, I know it’s not grass-fed or organic. We opt to roast grass-fed lamb shoulders than to buy ground lamb. 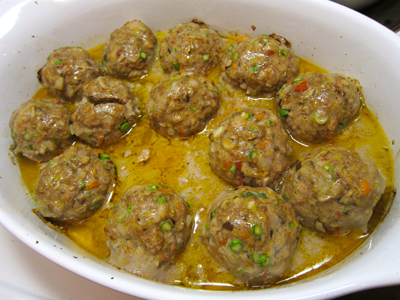 When I found Krav ground lamb at our local supermarket, I knew what we’d have for dinner: lamb meatballs. I make my paleo-version of meatballs a lot at home, but with ground turkey or, occasionally, veal — never lamb. 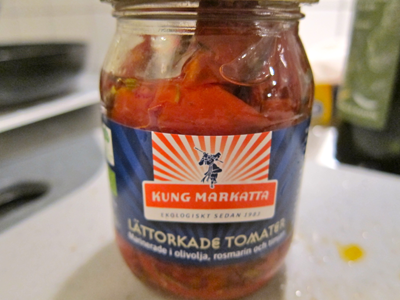 For my first lamb meatball attempt, I was inclined to also purchase this jar of marinated tomatoes — it seemed it would go well with lamb. Normally, I put carrots, onions, and mushrooms in my meatballs. When we got home, I realized I only had 1 carrot in the fridge — but I had a lot of asparagus, so I decided to add them in the meatballs, too. The result was fantastic! 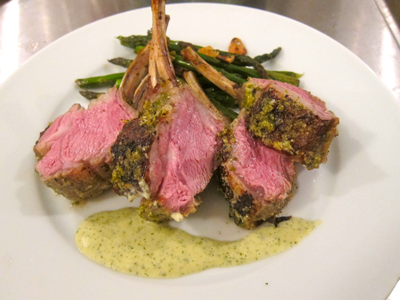 The asparagus pairs nicely with lamb, and gives it a fresh vegetable crunch. I will definitely make this again and again while in Stockholm. First, to make the meatballs: mince, chop, and dice all the vegetables as indicated above, as well as the marinated tomatoes. Put them in a large bowl. Add ground lamb into the bowl. Mix the lamb and all the vegetables (I use my hands) evenly. Crack 3 eggs into the bowl (I have David crack them for me, so I don’t have to wash my hands), and mix well. Season with salt and pepper. Drizzle some olive oil in a large baking dish. 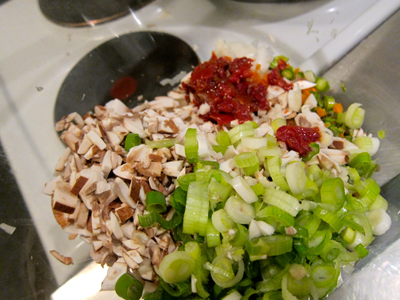 Roll the lamb/veg mixture into a ball — I make them a little smaller than the size of a tennis ball. Place them in the baking dish. Put them in the oven for about 25 minutes. While the meatballs bake in the oven, you can make the tomato sauce. Heat a saute pan with some olive oil in it. When the pan is hot, add the sliced garlic. Let the garlic sizzle for about a minute or two, and then add the cherry tomatoes. Bring the heat down to a simmer. The cherry tomatoes will release a lot of juice. 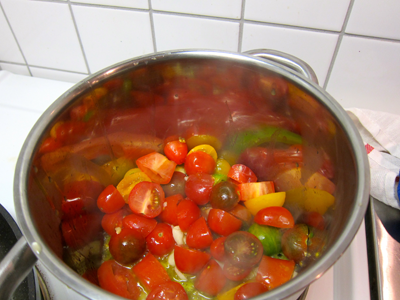 When the tomatoes have softened, add the can of tomatoes, season with salt and pepper. 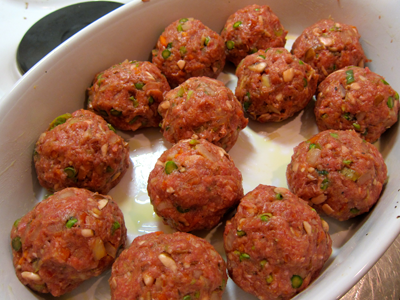 After baking for about 25 minutes, the meatballs should be cooked through. A lot of fat will have rendered out. Let it rest for about 5 minutes. 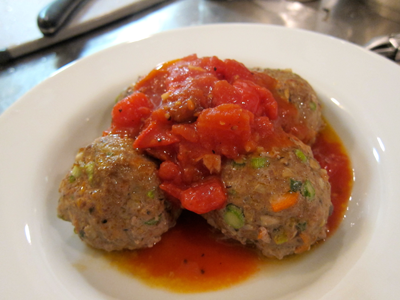 When rested, put the meatballs in a bowl and top with the tomato sauce. Enjoy!